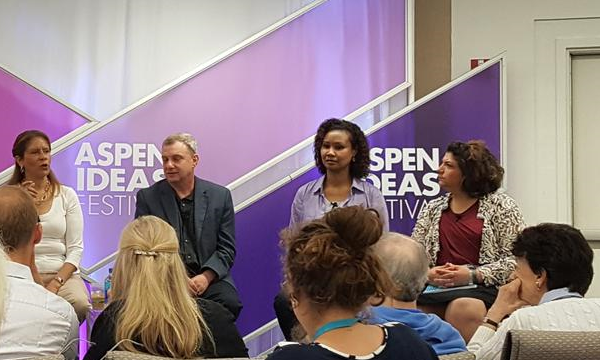 This event was held during the 2016 Aspen Ideas Festival. Roughly one in four students choose business as their undergraduate major in the US, making business the most popular academic pursuit. While business majors excel in the post-graduation job market, some studies suggest humanities majors actually fare better over the course of their careers. How do we retain the liberal arts in the face of demand for business credentials? How are today’s students thinking about their current academic choices and future professional roles? And is “Accounting or Aristotle?” really a false dichotomy? This session features five exceptional educators from undergrad programs as diverse as Berkeley and Wake Forrest. Featuring Festival Scholars Georgette Chapman Phillips, Charles Iacovou, Moses Pava, Rachel Reiser, and Erika Walker. Moderated by: Judith Samuelson. LISTEN: THE FULL SESSION IS AVAILABLE ONLINE.